Bc battery choose us like official web reseller. This is a guarantee for. Bc battery - bike lithium battery for yamaha yfm350 ry raptor 2009> 2009. Lifepo4 - litio ferro fosfato. Ytx7a-bs - ytz10s - ytx12-bs Every motorcycle needs a suitable battery model, a battery charger for 5000 motorcycle, a scooter or a maxi-scooter, a battery charger for over 5000 motor vehicles, perfectly compatible with the outdated lead acid batteries. A step into the future. What distinguishes modern lithium-ion batteries compared with acid lead are: an ultra light weight comparison to a low to 80%, a high starting current: up to 50 times the capacity of a normal battery lead acid 2000 cycles of charge and discharge against the 300/400 of traditional batteries, safe even in the sports field. Bc battery batteries are eco-compatible and not polluting, they do not contain acids and heavy metals like lead, cadmium, mercury. An extra security for your bike. Lithium batteries have very fast charging, resisting high currents, up to 10 times the battery capacity, remain safe since they are not fuels and without the danger of chemical leakage from the casing. They also have very low self-discharge times, you will not have a hard time. Italian heart with battery batteries. Battery is an indispensable element in motorbikes and scooters, is the heart of each of the world's most modern motorcycles, and is highly integrated. Efficient care of the electrical system is fundamental to the preservation and safety of their motorcycles. We at omnia racing has chosen a battery for the quality of its products entirely made in Italy. Bc battery produces lithium ion batteries (lifepo4) and charges battery packs for care, maintenance and optimum storage of batteries during the winter break or for short periods of the motorcycle disuse. The battery charger is also part of the bc battery line. 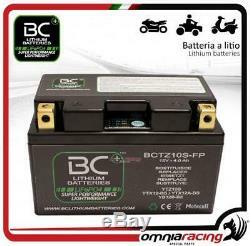 Link alla categoria dei caricabatteria bc battery. In 1994, the passion and experience of manufacturing bertollini created omnia racing, with the aim of representing a reference point for everyone fond of bikes. In 2000, when the company joined the competition, the company was founded, a society based on the passion and competence needed to create and trade the top products for motorbikes. Our continuous search for perfection and performance, using advanced technologies, has allowed us to interact with internationally recognized pilots and teams. Our products are excellent for both road and circuit use. They are continually tested by our technicians and pilots, thus improving the dynamics, dynamics and structural features of the materials adopted. The experience gained through the years of the competition has been greatly improved. Accostato, afam, aim, akrapovic, andreani, arrow, bazzaz, bc battery controller, bitubo, bmc, braking, brembo, bst, capit, castrol, derry moto, tuning fork, did, discacciati, eibach, ek, fabbri, far, frentubo , galfer, gbracing, giannelli, gifrap, givi, gopro hero, gpt, h2o, hagon, ixil, jollymoto, kappa, laser, lcr saddle, leovince, lightech, mafra, marchesini, marvic, marzocchi, matris, mivv, mra, nissin , ohlins, pbr, polini, pt, rizoma, rme, robby moto, sachs, stm, stomp, superb, suter, termignoni, valtermoto. Omnia racing special parts is in close contact with its customers, taking part to several important events: padova expo bike, national and international races, free circuit sessions. On the web, we are always associated with a direct contact with the customers, so we suggest the product that best suits their needs. This should allow our customers to feel at ease. All this has not been a decade ago, a reference point in italy; in addition, our products are still in demand in Europe and in the United States. The item "bc battery moto lithium battery for yamaha yfm350 ry raptor 20092009" is on sale since Thursday, March 29, 2018. It is in the category "auto, motorcycle parts, accessories \ motorcycle \ spare parts \ electrical parts, ignition \ batteries ". The seller is "omnia-racing" and is located at / in it. This item can be delivered anywhere in the world.